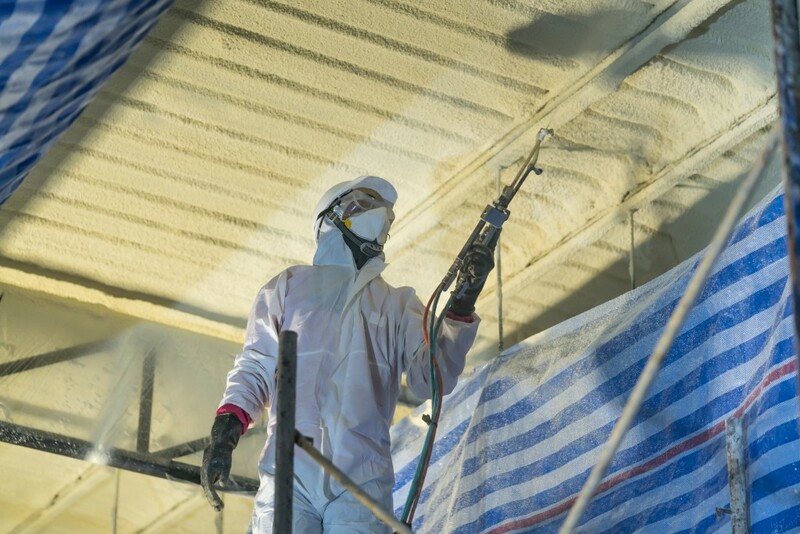 Spray foam insulation or spray polyurethane foam (SPF) is a type of foam used in building construction to minimize air infiltration and provide thermal insulation. It is created with the mixture of several liquid components. These liquids react to each other quickly and expand to form a type of foam capable of providing insulation, sealing gaps, and establishing vapor and moisture barriers. The three main types of SPF are mainly used for insulation. Each type is created with unique liquid substances and has a varied method of application. 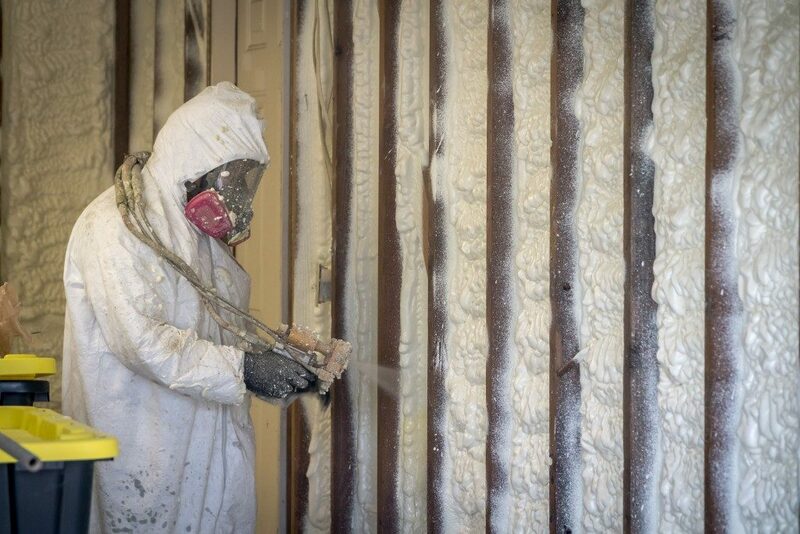 Spray insulation with high-density is often used for construction areas that require high insulation and strength. This type of SPF has a limited expansion structure and requires less material for covering and insulating a given space. It is most often used for exterior and roofing applications because it has a seamless and monolithic structure. This spray foam also has thermal resistance properties to reduce overall energy costs of a building. It provides air and water infiltration protection and strengthens the area to which it is applied. When applied to the roof, SPF increases a building’s ability to withstand wind uplift and reduces the damage it experiences from high wind speeds. The benefits of medium-density SPF depend on the type of building structure and climate it is used for. Medium-density foam acts as a barrier for air, vapor, and water. It is resistant to moisture from wind-driven rains. It can also reduce noise and provide high tensile and bond strength. For these reasons, this type of SPF is most commonly used for interior wall cavity filling and unvented attic applications. Medium-density SPF is a closed-cell type of spray foam used where there is a need for high thermal resistance or insulation effectiveness. Low-density SPF is a type of open cell foam that provides an air-sealing barrier and continuous insulation to construction applications. Its open and relatively large cell structure offers flexibility to the hardened nature of the foam. The foam remains relatively soft after the curing process. As such, it can continue to provide high insulation over time. In addition, SPF with low-density absorbs sound and provides adequate heat insulation and seals off both vapor and moisture through cracks, joints, and seams in cavities. This type of foam is commonly applied to walls, ducts, ceilings, unvented and vented attics, and crawl spaces. Spray foams with high-pressure and two components are most often used for large projects like new building constructions and renovations. A high-pressure system provides support to the entire structure, preventing sags and sealing against insects and vapor. Low-pressure SPF is normally used for roof repairs, ductwork, and electrical or piping structures. It is suited for insulation application for small to medium-sized gaps. It is effective in preventing air and heat leakage as it seals off cracks, gaps, and wall penetrations around window frames, doors, and plumbing lines. This type of SPF is also used to fill in the small openings around previously installed insulation because it can further limit the amount of air and moisture entering a building. Following safe SPF installation practices prevents inhalation overexposure and maximizes SPF’s benefits for a building.